Firstly, it needs to be remembered that the variable success and penetration of the Catholic Charismatic Renewal into the Church owes its entire being - and its very origins - to the Church's cultural and liturgical revolution borne out of the Second Vatican Council. If the Second Vatican Council's ambiguity had not been so enthusiastically exploited, nor its 'Spirit' blown wherever it was blown by whoever was blowing it, then the 'renewal' (note well that due to its novelty within the Catholic Church it could never be called, as it is in Pentecostal circles, 'revival') would not have touched a single parish in the entire world. Without the removal of the fortress of the Latin Mass (fortresses are there to protect the city from an enemy btw) this would never have happened. Yet the 'floodgates', with the 'windows', were opened and a liturgy that can be abused with great ease is now the norm. The apparent and sudden announcements from Church authorities and its media that the glorious Mass of Ages had been 'dispensed with' must at the time have been hard enough for many Catholics during this time of unprecedented upheaval, but most could never have entertained that what would eventually come to replace it in many parts could be so in complete conflict with the perennial Catholic 'sense' of worship and liturgy as a variety of Evangelical Protestantism that attached itself to the Mass, attached itself to the Bride of Christ. Thus it is important when we examine the Charismatic contribution to the Catholic Church to recall that it did not emerge so much as from a vacuum, as establish its own sense of order in various regions out of liturgical chaos, confusion and ambiguity in the post-Vatican II years. Secondly, it should be noted that what is seen now at events, such as, Flame 2, which was held in London at the SSE Wembley Arena in 2015 would horrify most, if not every single canonized Saint recognised by the Catholic Church, with perhaps the modern exception of St John Paul II, who suggested that the fruits of the Catholic Charismatic Renewal may represent a manifestation of the New Pentecost for our time. On the issue of the Sacred Liturgy, however, I hope readers will not mind me saying that St John Paul II was not as intellectually well-equipped as his Successor. His strengths lay in other vital areas. I have heard it said that in regions of the World - especially in Europe, a small number of Bishops are friendly both to the Traditional Latin Mass - and promote it - and also to the Catholic Charismatic Renewal - and promote that too - but for the reasons given below I really wonder how intellectually coherent or logical, or sustainable that position really is. Those places, it is said, are producing vocations, notably in France. Not that this 'dual' promotion is a huge probem, mind, because it is very unusual for Bishops to promote the Mass of Ages anywhere. However, where the traditional liturgy is not promoted - but the Charismatic renewal is promoted, we should by now be able to make some kind of assessment of whether the Charismatic movement incorporated into the Catholic Church has produced the kind of fruit hoped for by even its most conservative of admirers and it should be noted that while St John Paul II made statements that publicly lauded the movement in its various forms, primarily for the enthusiasm which the movement has generated, his Successor Benedict XVI withheld such statements of praise. I expect - though I do not know - that those small parts of the World in which traditional liturgy and 'contemporary' charismatic liturgy are promoted and in which vocations arise, this may well be despite of, not because of the contribution of the Charismatic movement. We might ask ourselves why this may be the case. I would suggest that there are inherent problems within the Charismatic movement not because of the individual personalities involved in the movement - nor, let me stress this - their obvious good will towards the Church - but because the movement itself is borne out of a theology of rupture and severance with the traditional understanding of Catholic worship which has survived two millennia. This can be seen quite clearly on the CCR website which lamentably fails to communicate 'Catholic' because traditional sign and symbol have been erased. All is 'new'. That doesn't mean that the Catholic Charismatic movement in its variety of manifestations cannot and does not display great faith and belief in the Church's teachings, the supernatural, or that its enthusiasts would disregard the Catechism and throw it on the pyre, nor that there is no Eucharistic Faith within the movement, nor that devotion to Our Lady is obviously lacking within it, though some will argue that these are all possibly problems within the movement in parts. No, the obvious problem with the movement is that at a time when events like 'Flame 2' are aimed well and truly at the 'youth' of today and as its liturgical celebrations celebrate 'youth' and 'young, vibrant Catholicism' the Archdiocese of Westminster that collaborates in such mega-events for youth is unable send a single man to the seminary this year. Read that again. Not a single man. That speaks of a huge crisis. 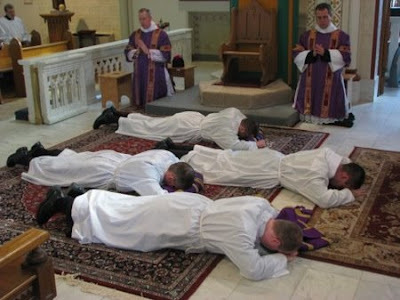 Why cannot young men be inspired to lay down their lives to become for God, for men, Alter Christus in the Mass? At some point, if it wants priests, every Diocese in the UK and beyond is going to have to ask serious questions as to why we aren't producing them. My take on the Charismatic Renewal is that its endemic weakness is precisely in its attempt to generate faith. It fails because, in my understanding the Charismatic Renewal within the Church represents fabricated liturgy on steroids. Fabricated liturgy and fabricated worship cannot bring us closer to Christ but to a fabricated Christ even if the liturgy works directly on feelings because liturgy is not fabricated or invented by man for man. It has been handed down, preserved intact for the Glory of God and the Salvation of mankind. The only concession to man that the Latin Mass grants is the Gift Himself, the Priest, the Offering, the Sacrifice. It is God-centric. For feelings, after all, like inspiration, come and go. Love for Christ and His Church comes through devotion and reverence in particular for the Most Holy Sacrifice of the Mass, the source and summit of the Church's life and prayer. With the Charismatic movement, no matter how 'in touch with the Holy Spirit' its enthusiasts claim the movement is, fabricated liturgy is given a new prominence within the Church, because we're no longer talking about a quiet 'Low Mass' for the Novus Ordo, but instead a 'Charismatic Service' in the Novus Ordo which may or may not involve Mass. The 'Charismatic Catholic Mass' has, in fact, become, in various parts of the World, what a Sung High Mass is for the traditionalist. Unfortunately, the 'Charismatic Mass', while perfectly able to generate lay enthusiasm and to support Faith in those who attend, cannot possibly give adequate glory to God in the Most Holy Sacrifice of the Mass and is therefore deprived on essential ingredients that bring man closer to Christ. This is because the work of the Most Holy Sacrifice of the Mass is entirely the work of God condescending to us and making that extraordinary condescension, the sublime Gift of the Sacrifice visible and tangible through the Priest, not through the laity, through action, sign and symbol. During the Mass, the Priest himself is not in the Mass an ordinary man even 'beckoning God down' but rather the Priest is acting totally in Persona Christi, standing in Christ's place, obediently allowing himself to be united to Christ's self-offering at Calvary to the Eternal Father. “It is one and the same victim; the same person now offers it by the ministry of His priests, who then offered Himself on the cross, the manner of offering alone being different.” The priest is the same, Jesus Christ, whose sacred Person His minister represents. Now the minister, by reason of the sacerdotal consecration which he has received, is made like to the High Priest and possesses the power of performing actions in virtue of Christ's very person. The Catholic Charismatic movement misses the essential ingredient that the traditional liturgy is able to supply in abundance and that is, quite simply, the sublime glory of the Priesthood. Pope Benedict XVI saw that the new liturgy and the fabricated, banal liturgy that so often comes with it, is a corrosive element within the Church for the priesthood -- not just for those who may be attracted to it, but to those who are already priests and who celebrate liturgy that is unable to communicate the ineffable Mystery of the Most Holy Sacrifice of the Mass. And, quite frankly, he should know, since he saw the collapse in faith in the clergy, was witness to it all with his own eyes, as well as to the deformation of sound theology, the clericalisation of the laity and its attending secularisation of the clergy. In terms of communicating what the Church really believes, even if the Catholic Charismatic movements have Eucharistic Faith, devotion to Our Lady and the Saints and a great deal else that is Catholic, without the Latin Mass handed down to us, the reason to become a Priest is entirely lacking and a malformed Faith is - though you're of course free to disagree - entirely likely. Now it so happens that from your average parish priest to the Pope, the Catholic Charismatic Movement is very much promoted while it is obvious that the small number of Bishops who promote the Traditional Latin Mass are regarded as maverick. So therefore, it is not likely that the 10,000 young people exposed to Flame 2 last year will be exposed to the Traditional Latin Mass. Nor will they be encouraged to be. The reason is of course that with the Traditional Latin Mass comes Traditional Catholicism. With traditional Catholicism comes an inevitable rejection of 'modern Catholicism' when it is embraced because it is discovered that we cannot invent new truth and we cannot invent worship, that God is always the first mover, that we discover God in silence, that holy prayer requires reverence, that we cannot innovate God into Being, He simply is. In time, we shall have to see whether Catholic Bishops begin to see sense and to look at the Fraternity of St Peter and the success in gaining vocations to the Priesthood and religious life that traditional orders are having, including within the SSPX and think of literally 'turning around'. However, mark this. 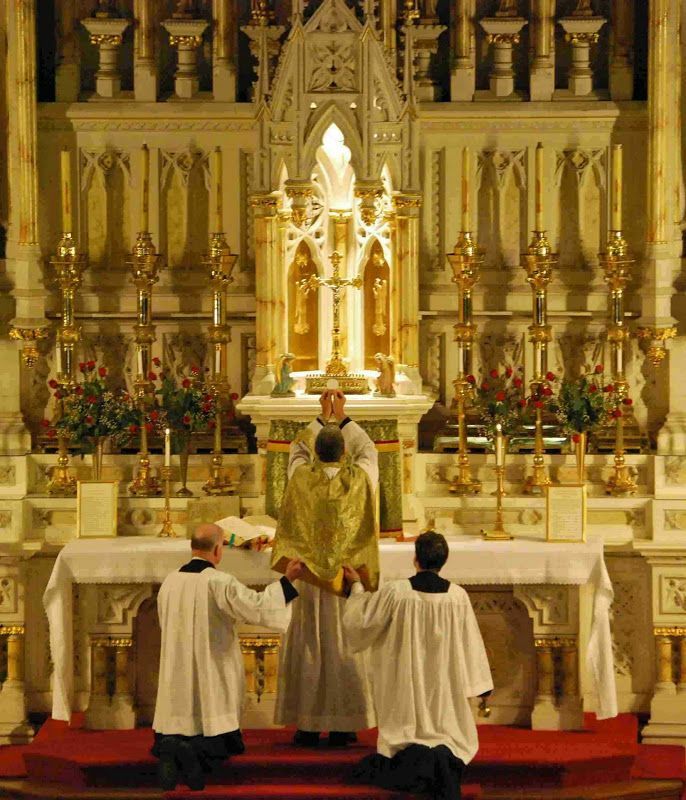 There are those within the Catholic Church who know very well that the Traditional Latin Mass is greatly loved and know too that this liturgy is entirely inflexible. They know it doesn't bend to your age, or your country, or your region, or your status. God stoops down from His Throne in Heaven to you. Even if they know it attracts men to the priests, they would rather have no men than those men as priests simply because they think differently to them.The Traditional Latin Mass teaches and forms men and women in the Faith. It schools them in prayer. It cannot be blended with other beliefs or other religions or other contemporary issues. It cannot be 'ecumenical'. It cannot act as a unifying force among those of other belief systems. It is not 'open to interpretation'. The same cannot be said of the Charismatic movement, which could be brought to blend so very easily with other denominations in the spirit of ecumenism and brotherly love. It is my personal opinion that a great many 'reformers' in the Catholic Church like the Charismatic movement because it would make a useful vehicle for the transformation of the Catholic Church. Not because it produces fruit. Largely it is undoctrinal, it is stimulated and sustained by fabricated liturgy, the Priesthood is undermined by it and it cannot - of itself - produce vocations to either the contemplative life or the secular priesthood. For these same reasons the Traditional Latin Mass is feared by reformers and for these same reasons, are those devoted to the Sacred Liturgy - be they lay or clergy, are similarly feared. Finally, there are a lot of very good people often with great faith and with love for Christ in the Charismatic movement in the Church. This blogpost is not aimed at denigrating their Faith, or their Hope, or their Love. This blogpost is concerned with the Glory of God made visible and tangible in the Extraordinary Form of the Mass, how the Church can begin to address the crisis in the priesthood (and the laity) and asks serious questions as to whether the fruits of the Charismatic movement are as positive as they have often been presented to the Faithful. I do not think that the 'Charismatic' Mass and the Traditional Liturgy can exist side-by-side, or enrich each other or present to the Faithful authentic, cohesive Catholicism with integrity because quite simply the Charismatic movement, even when it contains Catholic elements is not Catholic in a traditional understanding of the term. It is today what it in essense has always been - Protestant in root, and unCatholic therefore in flower - and as yet I have not even mentioned the movement's distorted understanding of the holy influence of the Holy Spirit in the Church and in Christian worship. A House divided will fall. It does not assist the Church to have a 'traditional' theology and liturgy and a 'charismatic' theology and liturgy. Nor can the Church with integrity present 'a choice' of liturgical styles that are 'diverse' and radically different. These two understandings cannot hold together because they are divergent and the well-supported 'charismatic' movement and the less well-supported traditional movement together will always give the impression that we can choose a form of Catholicism that is in harmony with our 'personal taste'. In the end, one of them will be chosen. Which one will it be? The one that produces fruit, or the one that produces 'the desired effect'? It might be worth checking out the numbers of members of the Neo-Catechuminate in the Westminster diocese, I understand they are producing lots of priestly vocations. With respect, Mr Bones, you may as well ask, 'what will replace the Blood of Christ in the Catholic Church?' You take the whole, unified, with one mind, one faith, or become the portion of foxes. 13th May, today is the Feast of St Robert Bellarmine, whom God raised up against the Protestant perversions preaching against the Papacy and the Catholic Faith. St Robert reminded the faithful of the purpose of the Papacy, Its Charism, and the truths of the Faith. What It is, and what It is not. St Robert Bellarmine, pray for us. He was canonized in 1930, by Pius XI. PS. Anyone with a smidgen of a sense of the Faith knows that the "Charismatic Movement" is diabolical. Bergoglio and his 'college' are not speaking as private people, sharing personal opinions - they speak and present officially with Novus Ordo authority. Their (in keeping with the Anglican concept of continuity) 'church' "had" 'traditional' theology and liturgy and is adopting a 'charismatic' theology and liturgy. It has 'a choice' of liturgical styles that are 'diverse' and radically different. These two understandings, so says the Vicar of the Novus Ordo who may not be judged by the Novus Ordo, hold together because they are divergent...and we can choose a form of 'Catholicism' that is in harmony with our 'personal taste'. As for the fruit, what are we looking for now that the world has been evangelized, and the only Scriptural prophecies waiting to be fulfilled are apocalyptic? Quantity or quality. The truth will make us free, Christ assures us. He also assures us, that we hear Him in His Shepherds. Viterbo---you are the only commenter who makes sense. While everyone mourns and moans about church changes, you point out that Francis is merely the vicar of the Novus Ordo--nothing more. I think why people are attracted to the CCR is not so much the liturgy which is often banalised, but to experience the charisms in action. I attend the TLM and also attend CCR events, I go to the events despite the abuses, because I can sometimes experience something quite profound despite the defects. Go to the Cor Lumen Christi events for example in the UK and you will see what I mean, regularly profound physical healings take place, irrespective of the many liturgical abuses that also take place. So Olivia---"miraculous" experiences (and who knows the origins of those "miracles") are more important than devotion to the pristine and holy sacrifice of the Mass? I'll take the true Mass over a "miracle." And btw I have been a part of both Protestant and Catholic charismatic services in the past. 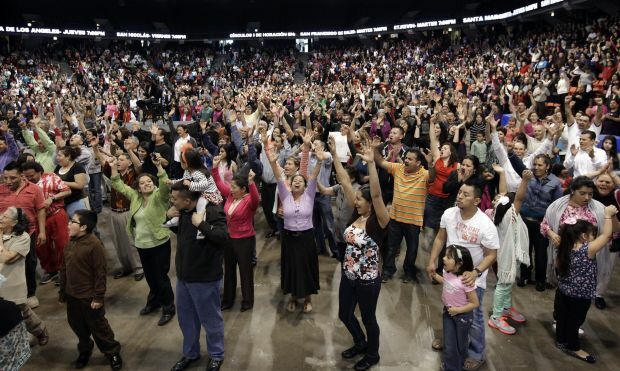 The Charismatic Renewal is a rehashing of Pentecostal Protestantism, which is heavily rooted in emotionalism. It is important to realize that the so-called baptism of the Holy Spirit was invented by the Pentecostals because they do not have the sacrament of confirmation. And their understanding of baptism is very different than the Catholic understanding of it. It is impossible to fold Pentecostalism into Catholicism because of the two very different theologies. I have left a parish that is apparently undergoing a stealth takeover by Pentecostals. There are some Catholic colleges in the US, particularly in the upper midwest, which have a heavy emphasis on the Charismatic Renewal. The Catholic Church is Tradition steadily built up and carried forward. This will not be replaced by the CCM or any other such movement. They have over the centuries in their dozens come and gone. It is the Holy Sacrifice of the Mass which will continue. Kim, no, what I am saying is what I have written...The Sacrifice of the Mass is an objective miracle. The CCR is dangerous for its liturgical abuses and the false ecumenism it espouses. But despite these abuses God in His sovereignty still uses the charisms in His name to touch His people. The extraordinary charisms haven't died out, that was a protestant novelty from the reformation. I have witnessed many people miraculously healed at CCR events, many of these people are stilled healed today. Yeah. Seeking truth, shockingly, leads you outside 'rome' these days. Pray for Dear Father, who suffers the temporal burdens that ignoramouses depend on those, other than themselves, suffering - if they have a wit of faith. Bonester come on---print something about Frank likening Jesus to Isis in the Le Croix newspaper interview and about him saying Jesus approved of divorce and remarriage out of mercy in a recent homily. You are a lighthouse!! There are so many crypto-schisms in the house of the Novus Ordo we would need Anne Boleyn's digits to count them on. I recently received a letter from the Novus Ordo 'bishop' of 'my' diocese accusing me of "Operating out of one model of Church....confusing uniformity with unity. We must as Catholic church have unity - unity of doctrine, worship, faith. Uniformity can be more about cultural, language etc. and so different but unity remains." One sentence denies the next, how modernist. What a load of number V two. Nonesense. He may as well have said 2+2 = 5 and 4 if you are flexible. Deliberate sustained variance is anti-unity. And for a purpose. The dissolution of uniformity. A perceived 'authority' who presents Christ like spice girls is a sham. Well. What is a bloggod? God bless you, Seattle Kim, and God have mercy on the readers, and the supplier. The Pope appears to be well on-board with the Coudenhove-Kalergi* plan; I just wish that the name Coudenhove-Kalergi were more widely known. If it should become part of the "mainstream" discourse, it'd go a long way to shifting the Overton Window in our favour. I have been a convert for some years now. My search for God led me from my family Methodist roots, away altogether, then to about 6 or 7 different denominations. I was always looking and being led on and on. The last Protestant church I attended was a large, economically middle/upper-class, fundamentalist/Charismatic church in Alabama. These weren't snake-handling nuts. Many people who had been in the beginning of the Charismatic "revival" were members. Although I was in the heart of a place where it was still going fairly strong, it became evident to me that the original "movement" was fading and had been changed by tv-personality preachers and the like who made big $$ in their enterprises. However, the ordinary people themselves were still people who had seen miracles, experienced what they believed was the Holy Spirit, and whose lives had been forever changed. I was a very logical, reason-based thinker, not one to be seduced by emotionalism. I agree in part with Olivia. If you were to say to me that there is no possibility the Holy Spirit COULD and HAS manifested Himself with some of these people, I would have to understand and forgive that assumption. I have seen people whipping themselves up with emotionalism. I have also seen and directly experienced myself another phenomenon which I can only understand as something of God. It may not be all-or-nothing. I think we should remember that we do not fully understand the mind of God and that the Holy Spirit can go where He wants to. I realized this was not my last stop. I prayed, asking God continually to direct me. That was to the Catholic Church, and not the "new, happy-clappy" church. I knew no faithful, Mass-attending Catholics. My conversion was through reading lives of the saints, other Catholic literature, and through the Holy Spirit guiding me. It was exactly the lives of the great mystics that drew me on to dogma and to my final home. The Lord put me in a wonderful parish with a priest who personally taught a huge RCIA group in the most orthodox way, using the CCC. It was a Novus Ordo parish, but everything was done according to the real guidelines, the music, the reverence...all excellent. The parish later offered a Latin Mass also. It was not until I left that parish that I began to find out what was happening in the Church. I have no desire to attend Catholic charismatic events. I see in my own parish people raising their hands, holding hands...not me. Before I left that church in AL, I was sitting in a pew one day. I was sad and upset because I had seen so many errors in thinking and believing. I asked the Lord: "Why?" You don't have to believe me, but I got an answer. As best I remember it was this: "I love my children who love Me. I will go out to find them wherever I can. Think of this place as a kindergarten." At that moment, the last thing in my mind was that I would be a Catholic. I think of myself as Traditionalist. I cling to the Cross of Our Lord and beg Him to keep me faithful to Him and our 2000-year tradition, to my death, no matter what happens in the institutional Church. So, what I experienced? I don't think that was the devil, unless someone wants to believe the devil is helping folks to become traditionalist Catholics. Sedevacantism. The absolute joke of a belief that an "indefectible" Church has had no pope for 58 years. "However, mark this. There are those within the Catholic Church who know very well that the Traditional Latin Mass is greatly loved and know too that this liturgy is entirely inflexible. They know it doesn't bend to your age, or your country, or your region, or your status. God stoops down from His Throne in Heaven to you. Even if they know it attracts men to the priests, they would rather have no men than those men as priests simply because they think differently to them.The Traditional Latin Mass teaches and forms men and women in the Faith. It schools them in prayer. It cannot be blended with other beliefs or other religions or other contemporary issues..."
But what about the Novus Ordo 'rites' of ordination? What a monumental revolution - flicked off like fluff. There is a big challenge before those who pray for faith and daily conversion to the faith. The rites are as important in the revolution away from truth as the new doctrines of VII. @anonymous. But the truth is, the Chair of Saint Peter can be vacant for a number of reasons for an unspecified length of time - this is Catholic doctrine - not an ordinary circumstance to be sure. But heresirachs as Catholic Popes - completely against Catholic doctrine. If we have a sense of the faith we surely see that the 'great apostasy' is flourishing in the former real estate of Catholicism. Communion being the heart of the Mystical Body of Christ...with whom are each of us in communion? No concord between Christ and belial. This simple direct Scriptural fact obliterates the whole new ecclesiology of VII. Remember the Assisi scandals? Flouts the first commandment and is ongoing. Remember the New Missal which revolutionised the 'Catholic' liturgical 'year' - flouts the Council of Trent. Remember the encyclical of Roncalli - the first 'papal' encyclical to be given public praise by Freemasons. Roncalli also made very public claims that his decision to call the second Vatican Council (against the advice and wishes of Pope Pius XII) was inspired by the 'holy spirit'. There is a public historical break in continuity. The Novus Ordo, like Anglicanism, has no continuity. The concept of 'continuity' was posited by Protestants who wished to make claims to 'Catholic' authority, while having formed a new religion. The substantial - not accidental - establishment of Novus Ordoism is a revolution against the Catholic Faith. And so here we are. What does the faith ask of us? To keep the faith and hear the voice of Christ in those to whom He has given authority - what few Bishops have escaped the apostasy and invalid rites. Happily we have 2000 years of evidence and instruction, inspiration and example to follow. Those who see that Pius XII was the last Vicar of Christ keep the faith, watch and pray. I know who the joke is on, anonymous. I would pray it wasn't on either of us. No Catholic need be torn by decisions of 'private judgement'. We follow the faith or create our own. PS. It is rare to be given space these days - even a couple of years ago the good old Catholic tradition of disputation/debate was alive and well in the blogosphere - to respond online. May God keep you in His love and care, Mr Bones. Great article. Made me understand some of the wrong things about Catholic pentecostalism that I just could not explain: Too much feeling, too much creativity in liturgy matters. I agree with you that the Holy Spirit is indeed working wherever people seek Him and even in the Catholic Charismatic movement. I was a protestant, baptised in the Holy Spirit and speaking in tongues. Yes, CCM is like kindergarten. I cannot explain the reality of the manifestations of God in our protestant prayer services. After I became Catholic, I went to a Charismatic Mass and was not attracted by it, since I had experienced a tradtional, NO Mass.Emotions get tiring afterawhile. I sensed that with the protestant services that folks were indeed trying to revive certain emotions which had faded over the years. I myself wondered why I did not have the thrills and thought that I had sinned too much. Or that the particular prayer service was not open to the Holy Spirit and not spontaneous enough. We thought we were not open enough to movement of the Holy Spirit. I agree that the CCM is ultimately a dead end. It should serve as a bridge to true liturgy. It does seem to wake folks up to God. So many Catholics are worldly and indifferent to Him. The CCM folks are open to Him and that is good. I thought I would drop you this article (below) for the next time you want to inform people about what is happening with the Catholic NuChurch & CCR. I have no problem with 'a relationship with Jesus' teaching as long as it comes with 'the full package', and doesn't come complete with half truths (Fr. Tim Finnegan as said as much himself in the Catholic Herald a couple of years ago). I have tried to tell various people that the present teaching concerning this isn't working, including Clare 'I know it all' Short (by the way, I rail against her as she seems to be influencing far too many people in the wrong way i.e. neo-conservatism). Ignore the figure of 14 young Catholics suggested at the top of this article... I suggest that it is more than this figure, and it is a slowly growing trend. Hannah vaughan Spruce started off so well, and has been drawn into the 'Nicky Gumball & Charles Whitehead Ecumenism show', hook line and sinker. This is ALL happening because 90% of Catholic youth workers are coming out of CCR and are being brainwashed by false teaching on ecumenism - fact! I understand that you may wish to highlight other things going on in the Church, but this is literally going on under our noses, and no one is calling it out(though you have initiated the first part of the narrative in this post). I note that the discussion was about specifically about Celebrate. Let me be clear about this (AND THIS IS VERY IMPORTANT!!!)... the problem isn't with (a correct version of) CCR, or the correct teaching concerning 'a relationship with Jesus'. The problem is with leaders in CCR specifically brainwashing young Catholics with a false version of the Catholic faith (and specifically FALSE ECUMENISM). Some of these young people then go on to be the Churches youth leaders. CCR is the main source of Youth leaders these days. Iffy CCR has been slowly producing Catholic youth workers since the 1980's, and even if they have not been directly influencing them, they have indirectly influenced them. CCR effectively ran Proclaim 15, such is their growing influence.... And it wasn't the fully Catholic CCR people involved. It was the false ecumenical types.